in trees to make their nests. they are reluctant to fly any distance. 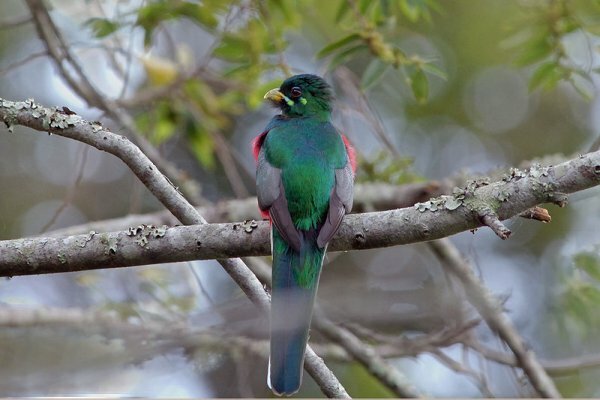 Trogons are generally not migratory, although some species undertake partial local movements. to fairly open savannah, and from the Equator to southern South Africa. It is the most widespread and successful of all the trogons. found in the mid story, occasionally in the canopy. make smaller migratory movements, particularly montane species which move to lower altitudes during different seasons. movements is however lacking. Trogons are difficult to study as their thick tarsi (feet bones) make ringing studies difficult. using their wings. The ratio of leg muscle to body weight in trogons is only 3 percent, the lowest known ratio of any bird. 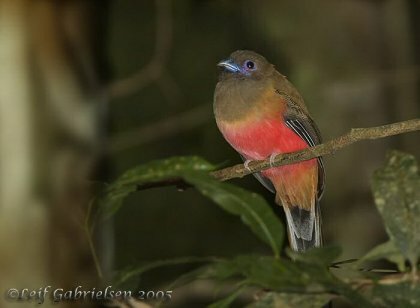 Trogons, Trogon collaris (two left pictures) and Trogon massena, Costa Rica. species tend towards red underparts and brown backs. their flight, trogons do not fly often or for great distances, generally flying no more than a few hundred metres at a time. slightly undulating. Their flight can be surprisingly silent (for observers), although that of a few species is reportedly quite noisy. Adult male Narina Trogon, Apaloderma narina, perched in Pigeonwood. 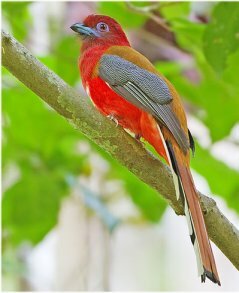 The Narina Trogon, Apaloderma narina, is a medium-sized (up to 34 cm long), largely green forest bird in the Trogonidae family. believed to be named after Narina, the mistress of the French ornithologist François Le Vaillant. are a grizzled grey, and remiges mostly colourless grey. white tips to the tertials (inner wing), and less distinct gape and eye flanges. eastern and southern South Africa. which both sexes incubate or brood. image of it is on the flag and coat of arms of Guatemala. It is also the name of the local currency (abbreviation GTQ). of the trogon order. 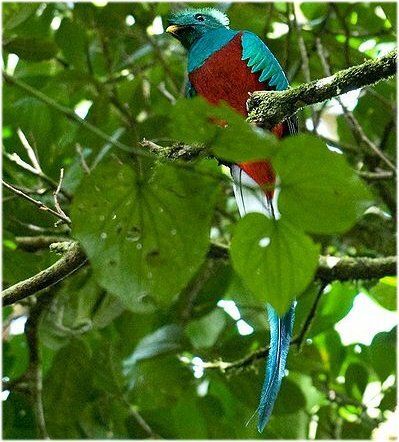 The subspecies costaricensis is slightly smaller than the nominate race and has shorter narrower tail plumes. green filamentous feathers, is yellow in mature males and black in females. Their habitat is montane cloud forests of Central America (from Southern Mexico to Panama). Emerald Toucanets, Brown Jays, Long-tailed Weasels, squirrels, and the Kinkajou as nestlings or eggs. whole before regurgitating the pits, which helps to disperse these trees. 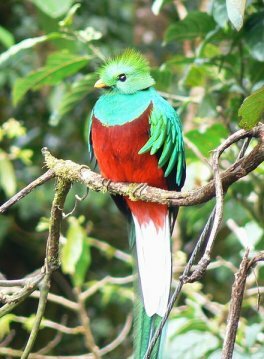 availability of suitable trees may limit the Resplendent Quetzal population. ready to survive on their own.